You may recall Tabitha Jussa’s 12th Man exhibitions last year which featured images of Liverpool and Everton fans. Since then she has been to other footballing cities in Europe as part of the Cities on the Edge project which ran throughout the Liverpool Capital of Culture year. 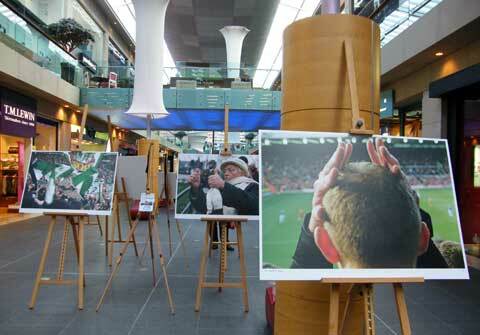 Some of the resulting photographs are now on show in the Liverpool Metquarter shopping centre. Some on the ground floor and others on the 1st floor. Cities featured include Bremen, Marseilles, Gdansk and Napoli, every picture tells a story, read the text here. Photographs by Tabitha Jussa. Featuring four European football teams: Werder Bremen in Germany; Lechia Gdansk in Poland; Olympique de Marseille in France and SSC Napoli in Italy in relation to the similarities shared with Liverpool.